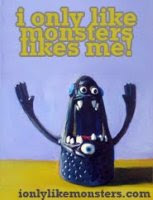 This past weekend erinmakesstuff's monsters attended Lovin' Cup's Lov-A-Palooza! Thanks to everyone who came out to enjoy the fall day! Read more about it HERE.